Are you content to “sit and soak?” I first heard that expression at the seminary. It was used to refer to parishioners who understand Christian discipleship as merely coming to church, sitting in a pew or seat and listening to (soaking up) a sermon. They are content to be spectators only. They like what they “get out of” church. But it’s one direction only. Now certainly we all have seasons in our life when we need to rest and receive, to heal and be comforted. But over the long-term of our journey of faith this cannot remain our only approach. It’s like a sponge that merely soaks up water but never gets rung out. It tends to get stagnant and begins to smell. For a sponge to be useful (and healthy) the liquid must be in a constant rhythm of moving in and out. This fits really well with what we a learning on Sundays in the “Faith That Works” message series, moving verse by verse through the book of James. 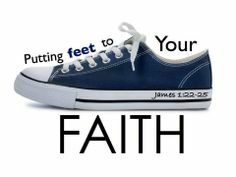 Perhaps no other book in the Bible tells us so directly that we need to put our faith into action as does James. The Apostle wisely tells us Christians to “be doers of the word, and not hearers only” (James 1:22, ESV). In other words, don’t just “sit and soak,” put your faith into action. The life of a disciple is really a two-way street. Yes indeed, we receive much from God. But for what purpose? Once we are God’s children through baptism and faith, He continues to pour out blessing on us… but why? You could argue that this is simply a reward for being His child. I would say that this may be true, but that is not only why God blesses us. He blesses us to be a blessing to the people around us that need God’s Love and Gospel in their lives! Even Jesus said, “Freely you have received; freely give.” (Matthew 10:8). We are to be sharing what we have been receiving, and doing what we are believing. And so at Redeemer, you’ll be hearing more about opportunities to put your faith into action. I’m excited about these two: Project Teams … and Missional Communities! “Project Teams” have grown out of a recognition that as people have increasing demands on their lives, their time and availability for ministry becomes more limited. While many desire to serve, few can afford, or want to sit on a long-term committee. And so over the years it has become more difficult to fill committee positions. As such, we are instituting on-call project teams. These pools of people will carry out the ministry functions that are formally assigned to committees. In some ways these project teams are like “virtual” committees that meet on an as-needed basis. You will be seeing more about these in the coming weeks, but I encourage you to sign up for as many project teams that interest you. (You are always free to opt-out at any time.) What will happen is that you will receive occasional emails informing you of specific ministry needs in the area of your interest. If you are neither interested nor available, simply ignore the email. But If you would like to know more, simply click through – with no obligation or commitment. If then you find a need that fits your interest and availability, simply sign up and you will receive further information and instructions. We believe that these project teams will allow more people to serve in meaningful ministry, and ultimately to put their faith into action! You also will start to see and hear more about “Missional Communities.” Rachelle and I are part of a two-year program through the Pastoral Leadership Institute called “Missional Leader.” In this program we are learning how to guide the congregation in reaching into our community through missional communities. What is a missional community? A missional community is basically a group of people who desire to see their neighborhoods and city the way that God sees them, and then to be equipped to engage them. We have just begun our first missional community at Redeemer, and are exploring missional living together. So far we have been learning that God is a “sending” God, who first sent His Son into the world to seek and save us. He also sent the prophets and the apostles. But now, He sends us out – to put our faith into action and share His Love for the lost, hurting and disconnected. This often involves getting outside of our comfort zones and talking to other people. But what we are learning is that wherever we go, and with whomever we talk to, God is already at work! I am looking forward to this journey with you, as together we learn to not only be hearers of the Word, but doers of the Word – putting our faith into action both in our church and in our community.